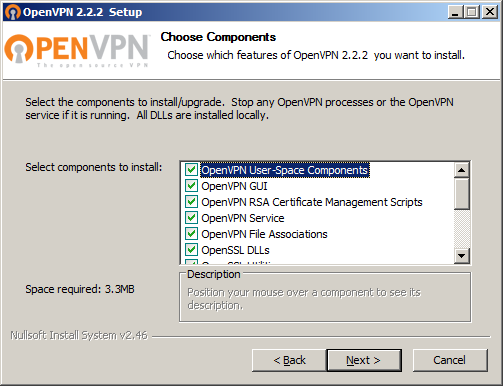 First, download the latest version of OpenVPN from the official OpenVPN community website. Choose either the 32-bit or 64-bit installer depending on what your operating system is. Click this link to go to the download page. You will probably be prompted with “Do you want this program to make changes to this computer?” and you should answer “Yes”. The License Agreement will open. Click “I Agree” to proceed. The next screen will be the component screen. Just click “Next”. This will take you to the Path Setup screen. Here, you should just click “Install”. 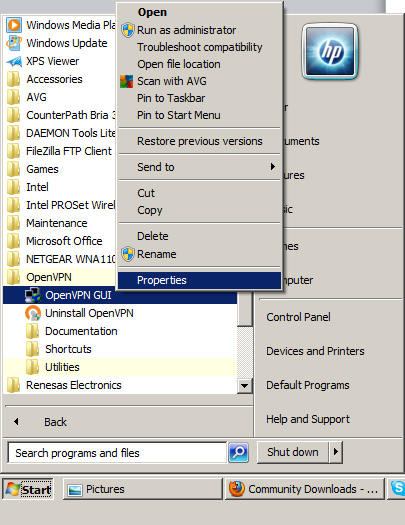 On some previous version of Windows prior to Windows 7, you may be prompted to install the “TUN/TAP Driver” during the installation process. If so, just accept the driver. The following window will show that the installation is completed. Click “Finish” to view the README file. Alternately, you may uncheck the box to avoid reading the README file. Please note: some important changes to the program may be shown in that file. Close the README when you are finished with it. 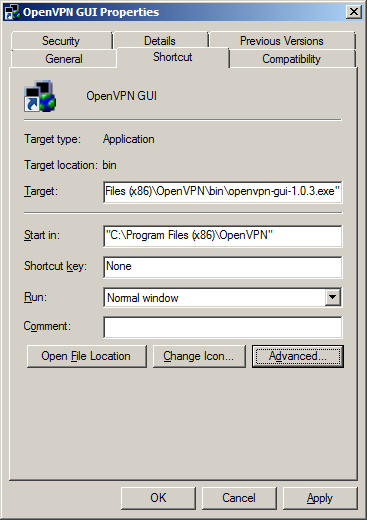 Now navigate to Start->All Programs->OpenVPN and right-click on “OpenVPN GUI” and go to “Properties”. That will bring up the following window. At this point, click on Advanced. 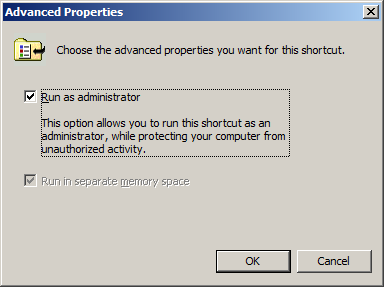 In this window, be sure to select “Run As Administrator” and then click “OK”. This will drop you back to the previous window where you should click “Apply”. 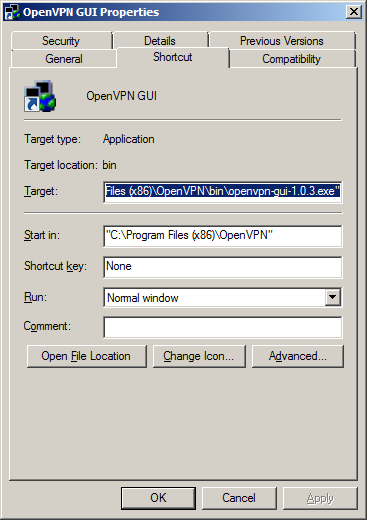 Depending on your User Access Control (UAC) settings , you may get the following window. If so, click Continue. This will drop you back to the previous screen. 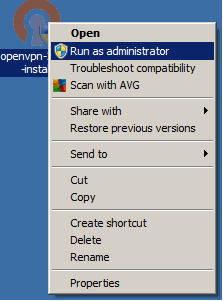 Click OK in this window to give the program Administrator permissions. You may be prompted with the following window. If so, please click “Continue” at this point. Setup is now complete and you should not need to repeat any of these steps again (unless something went wrong). 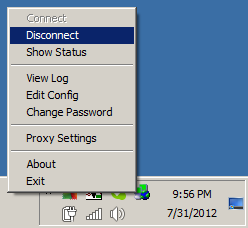 You will see many things scroll past quickly in the connection window as the VPN is negotiated. 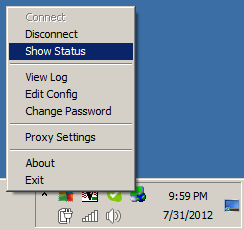 When it is completed, that window will disappear and the system tray icon will turn green and give a message that it has completed. 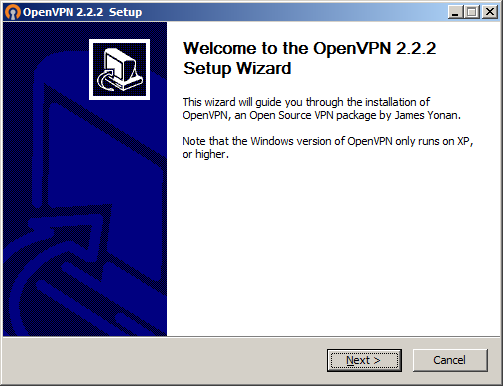 At this point, you are now connected, and the VPN is running. Should you find that you do NOT get a green system tray icon (it could be red or yellow also), please contact your Dark Wire VPN technical support (if this is an individual account) or your company’s IT Department (if this is a group account) to find out what to do next. Once disconnected, your system is off the VPN. In the event of problems, you may be asked to scroll through that detailed status screen to look for problems.